Model Number: BK650MC. Category: Back UPS. The APC Back-UPS 650 is an intelligent electronics-protection system that keeps your equipment safe during surges, spikes and outages. Connected secondary electronics are also protected without sacrificing the power needed to keep primary equipment up and running. 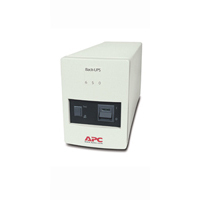 Also known as the BK650MC, the APC Back-UPS 650 is a stress-free solution that conducts self-tests to monitor battery performance and indicate a replacement is needed. It also uses precise charging to intelligently manage battery performance and maximize lifespan and reliability. An easy-to-read LED display screen even allows you to quickly gauge the system’s status and readiness. At CoastTec, our approach to working on UPS systems and accessories to manufacturer’s standards has earned us status as APC’s only certified refurbisher of single-phase units. This allows us to provide you with maximum value and an APC Back-UPS 650 that performs like new — for about half the cost of purchasing one off the shelf. Our APC-certified technicians go through 30 checks and reconfigurations to certify each refurbished product, ensuring you get a product that performs as well or better than a new one. We also provide free quotes and a one-year warranty on all products. After all, the UPS was invented to provide companies and individuals with dependable access to sensitive equipment. APC has been a trusted provider of UPS systems for nearly 35 years, and CoastTec is its recommended out-of-warranty service provider — the only company with access to APC’s engineering change orders. When you need an APC Back-UPS 650 at an affordable price, turn to CoastTec. Back-UPS BK300C BK500MC BK650MC 120 V (Sheet) | Installation and operating instructions for the 120V Back-UPS 200/300/500/650 products.